The Suffield Township Board of Trustees met on Tuesday December 11th before a crowd of 17 people. 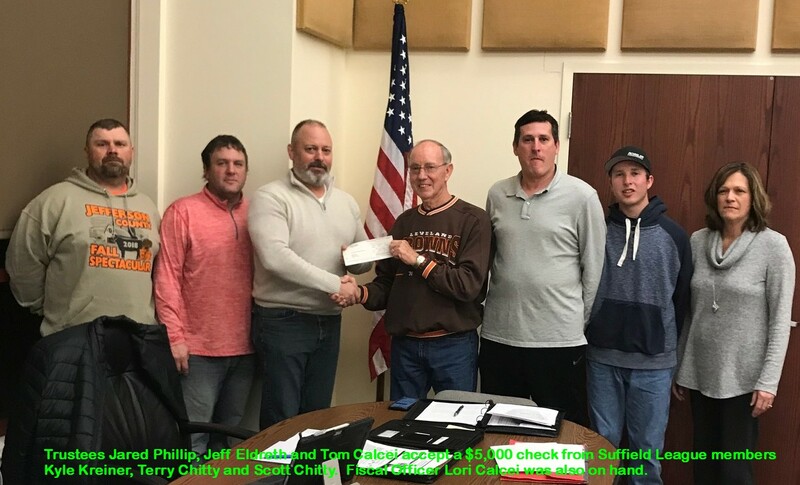 Kyle Kreiner, Terry Chitty and Scott Savage from the Suffield League were on hand to present a check for $5,000 to the Township to be used for the new electronic sign. Shortly thereafter, the trustees voted to to buy a new electronic sign for in front of the historic Town Hall. Trustee Jeff Eldreth said that the new roof on the Road Department garage has been completed. After an executive session, Eldreth motioned to hire Michael Osborne as the new Road Department full-time worker. Osborne is to start on the payroll on January 1st. Fire Chief Bob Rasnick reported that there were 81 calls for service in November. Tom Calcei said that NOPEC is again offering $1,500 to Suffield Township in 2019 to help pay for a community event. The trustees must apply for the money by March 1st. This past year, NOPEC gave the township $1,500 and it was used to help pay for the Fire Department Open House. It was nice to see the return of some familiar faces in the crowd; Don and Anne Monroe, Fred Herro, Bernie Trares, and Dave Vartenuk. The Zoning Commission meets on Wednesday December 12th at 7:00 PM. The Board of Zoning Appeals has a hearing on Tuesday December 18th at 8:00 PM. The trustees next meet on Friday December 21st at 7:00 AM for their regular meeting. Then on Friday December 28th the trustees hold their 2019 Re-organizational meeting at 7:00 AM. All these meeting are in the Suffield Community Room at 1256 Waterloo Road.